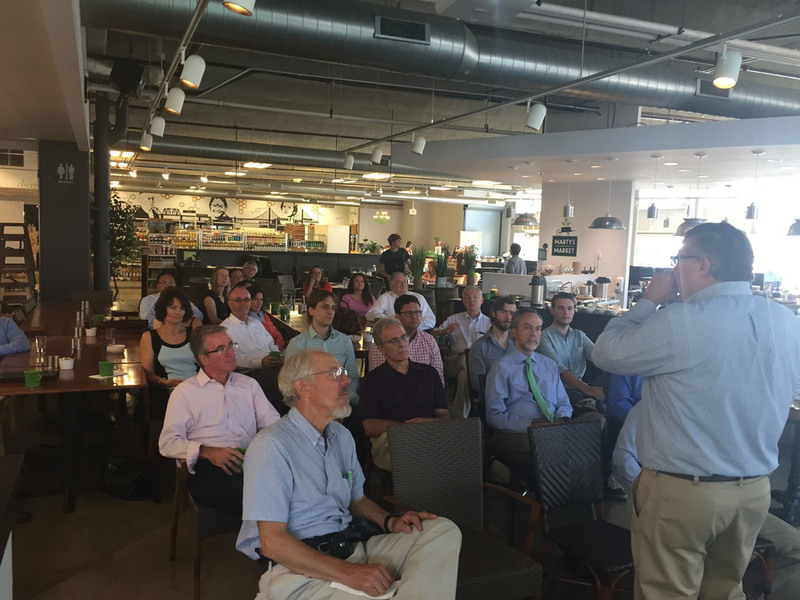 BioBreakfast is a weekly gathering of individuals in the Pittsburgh life sciences sector from 8-10 AM every Tuesday at the LifeX offices. Pittsburgh’s Biomedical Sector has long been very siloed. The medical professionals and university researchers do not interact with private industry enough and vice versa. Big companies and small companies are often completely disconnected. The BioBreakfast is an attempt to bridge the divides between the disparate groups that shape the regional biomedical sector. Most importantly, the Breakfasts try to spur informal networking so that people can build stronger networks and help identify opportunities and individuals they can work with to advance ideas. The BioBreakfasts happen every Tuesday unless that Tuesday is a National Holiday. Otherwise, they are on. You do not need to register. There is no cost. Just show up and take part. In response to a question about how to find money and talent for your biomedical company, Bruce Peacock remarked “move to Philly!” He noted that he can raise money and recruit an all-star team of professionals over breakfast at Minella’s, a Wayne, PA diner, on a typical morning. He was not joking and Bob Dickson, CFO of Cardiac Assist, took his comments to heart. The entire drive back from a PA Bio meeting in Philadelphia, Bob carped that “we need a Minella’s.” Bob was right, and the Biomedical Breakfasts are an attempt to create a place where people can raise money, know-how, and resources for their biomedical projects. The Biomedical Breakfasts are the place to come to quickly connect with a diverse group of professionals working in the life sciences in Pittsburgh. Click on the pin for directions in Google Maps. Complete the form below to be notified of future events.